Fresh from its critically-acclaimed debut at the 2015 Toronto Fringe Festival, All Our Yesterdays, playing again at the Factory Theatre Studio as a part of the Next Stage Theatre Festival, is a gripping, polished production that tackles the issues of sexism, stigma, and female education in a harrowing story ripped from recent headlines. All Our Yesterdays is centered around two sisters, Hasana and Ladi (played by Chiamaka Umeh and Amanda Weise respectively), who are two of the 276 Nigerian schoolgirls kidnapped by the terrorist group Boko Haram on April 14th, 2014. The older Ladi was taken at gunpoint from her school along with her younger, developmentally disabled sister Hasana. Scenes of them jailed in their captor’s hut are interspersed with scenes depicting the events that led up to their capture — including Ladi’s recent admittance to the school where she was kidnapped. There are some major reveals towards the end of the play that I will not spoil here but, suffice it to say, the revelations came as a major surprise to me and so altered my perception of the rest of the play that I haven’t been able to stop thinking about it since. Playwright/Director Chloe Hung’s writing is especially sharp and the banter between the sisters is littered with witty, tongue-in-cheek quips like how no one remembers that Venus comes before Earth because the planet is named after a female god. However, where Hung truly impresses is her ability to comment on larger issues in the dialogue without sacrificing naturalism. The everyday hardships faced by the sisters due to stigma and sexism feel even more poignant because the references were so well woven into their speech that, as a person who has a sibling of her own, the frustrating-yet-loving interactions between Hasana and Ladi completely rang true for me. 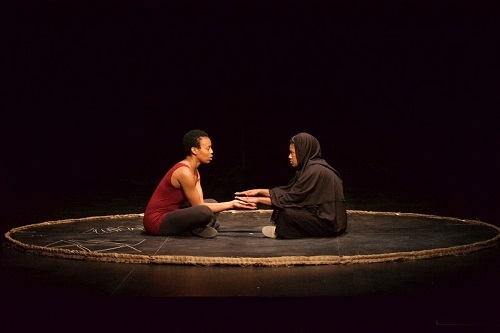 Credit must also go to Chiamaka Umeh and Amanda Weise whose spectacular performances had me hanging on every word. Hung had written characters whose personalities complimented one another but it was Umeh and Weise who elevated each line with their heartfelt deliveries and spot-on pacing. The intimacy of the relationship between Umeh and Weise was so believable that their final touch almost had me in tears. There were a few moments at the beginning where I thought Umeh was erring on the side of exaggeration in her portrayal of Hasana, but her performance became more nuanced as the play went on. The only other things I found problematic was a song used on stage and the last scene, both of which I found to be unnecessary. My companion thought the song was too “heavy-handed,” and I thought that the overlapping of the song and dialogue in the last scene sounded messy. As well, the chilling penultimate scene was already so clear in its implications that the last scene seemed almost redundant to me and slowed the momentum built in the latter half of the play. Hung’s direction is so strong everywhere else that I really think the play could be tighter without these elements. All that aside, the most startling realization I came away with was that I, like many others, had almost forgotten about this tragedy until I saw it unfold in front of my eyes. According to the program, almost 200 of the girls are still missing yet the headlines have disappeared along with the hashtag. Why have we ceased to care about their lives? What is being done now, if anything? Are they even still alive? To paraphrase a remark from one of the characters: just because you don’t see something, it does not mean that it doesn’t exist. Tickets for Mainstage and Studio shows are $15 and Ante-chamber performances are $10. Photo of Chiamaka Umeh and Amanda Weise by Rick Bartram.